Virtualbox is available in 28 languages. VirtualBox is also a platform with 9 apps listed on AlternativeTo. Browse all 9 apps for VirtualBox. VirtualBox (sometimes referred to as Vbox, VirtualBox OSE) was added by Mogelfar in Mar 2009 and the latest update was made in Apr 2019. The list of alternatives was updated Feb 2019 There is a history of all activites on VirtualBox in our Activity Log. It's possible to update the information on VirtualBox or report it as discontinued, duplicated or spam. QtEmu is a graphical user interface for Qtemu. Discontinued The project is unmaintained and the last release was on November 12th, 2007. Run Linux programs on macOS, a different Linux distro, or a different architecture. Alternatives to VirtualBox for Windows, Linux, Mac, BSD, Web and more. Filter by license to discover only free or Open Source alternatives. This list contains a total of 25+ apps similar to VirtualBox. 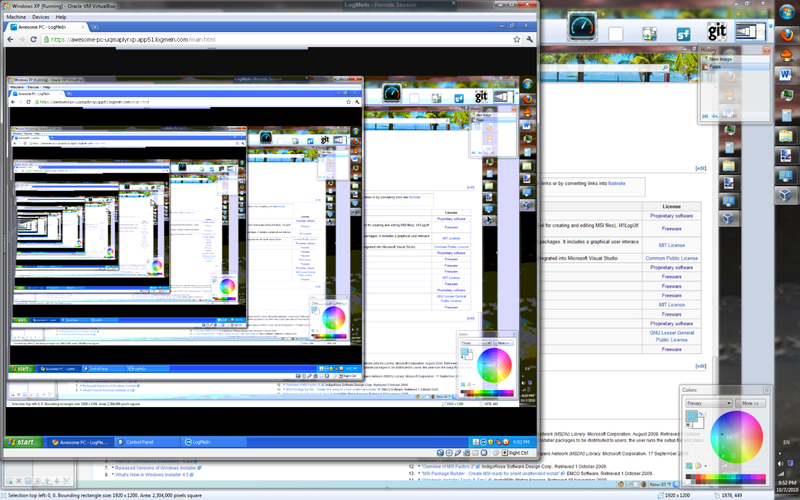 VirtualBox is great. Use it regularly to test software out so I do not have to worry about corrupting my primary desktop. Has saved me a couple times from bad installs / uninstalls. I like it but I have had some problems when using it in my laptop, It makes everything work slower but still the best way to get a virtual machine to work. i think this works just fine considering it's free. I really don't think vmware is worth it. Just as a performance gripe, it has this noticeable lag every second or so. I would only use this to test very basic things or to observe different operating systems. Otherwise, just install the OS on another petition. Experience it in it's glory, get drivers and stop the lag. VirtualBox was kinda cool when it was owned by Sun. Now that Oracle has bought Sun they will probably let it die a slow death since there is no revenue in it for them... sad. I would disagree, it is not 'computer' problem. I been running VirtualBox under many different macs, with both low and high specs and the experience is always not perfect. However, it is free in contrast to Parallels, so there is not much of space to complain. This works great I am on Ubuntu and I sometimes want to run my windows programs and the ones that do not run in Wine I run in this. I have Windows XP installed on this and I can run it at pretty good speeds. Because it is being emulated it is not as fast as the operating system would be at native speeds, but it does good enough for me. Simply the best virtual machine ever... Free and functional! I like VirtualBox but I'm looking for something that also allows a virtual network so that I can set up a dedicated virtual network for the virtual appliances to connect to (for DNS & RADIUS testing). Any idea on what is out there, if there is anything out there like this? Why is virtualbox more popular than vmware player? Currently I've been using vmware player for a while but am evaluating whether to make a switch or stick with it. My only real issue with it is switching the network adapter used. Looking on the net though every review seems to say vmware player is better/faster (if only marginally) but on here the votes aren't even close with virtualbox in the lead. So just curious on opinions. Virtualbox actually allows you to create virtual machines, not just to run them. Well, VMWare Player wasn't able to create virtual machines before the release of Version 3. So I guess Virtualbox had a head start, since it's been around for years. Update: It turns out that VMWare Player can't make snapshots of a virtual machine (basically, restore points). Virtualbox has included this feature for a while, and it's pretty useful-- if you ever get a virus on your VM or mess up its boot files, you can always restore to a previous snapshot. So that's one thing. 1.Virtualbox is earlier than VMware Player. 2.You can not easily find download link of VMware player on website. 4.Oracle(formerly Sun Microsystems) has created it. 6.All features are provided in a single free version. "Portable VBox isn't made by Oracle. The portable 64bit-Version seems to work only with a parallel original VirtualBox Desktop installation."